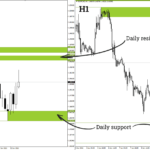 Horizontal support and resistance levels are used to identify price zones where the market move can slow down or price reverse is likely to occur. Levels indicator helps identify find entry signals that appear during a deep market correction, or calculate stop-loss and take-profit. Horizontal support and resistance levels have been used in trading since the beginning of the 20th century. They work because traders think that they have to. 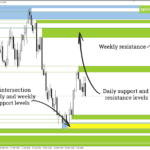 Levels indicator plots support and resistance levels that based on price patterns appearance of which suggests that there is a local price reversal on the chart. They are universal and can be used without fitting to historical data. At the time Levels indicator includes 28 price patterns that complement each other. 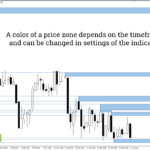 A color of a price zone and horizontal lines depends on a timeframe and can be changed in settings of the indicator. The indicator plots support and resistance levels on the selected and lower timeframes. 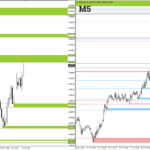 For example, Daily levels are shown on D1, H4, H1, M30, M15 and M5, but they are not visible on Weekly and Monthly timeframes. It keep charts as clear as possible and lets one see the most important price levels without switching between timeframes. An interception of levels on different timeframes is often an important price zone and displayed on the chart as a combination of colors. Versatility – horizontal support and resistance levels are universal and can be used without fitting to historical data. Most of the indicator settings are related to color. Absoluteness – unlike many technical indicators (Moving Average, RSI, Stochastic and others) Levels is based on the pure price, and not on the derivatives from it. Traders are forced to replot support and resistance levels all the time. 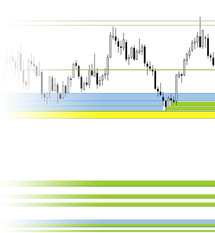 And the lower the timeframe the more often you should actualize the nearest price levels.This task is greatly simplified with the help of the indicator. 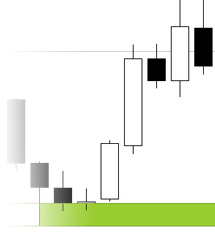 Besides, you can buy Levels indicator on MQL5.com. The indicator builds levels on different timeframes in real time, it is not intended (and quite useless) for building levels in MetaTrader terminal’s testing mode, due to one timeframe limitaion. Therefore, don’t download demo version of the indicator from MQL5.com. If you would like to download the demo version of the indicator, fill the form. We’ll send you proper version of the indicator. fill in the form on the right and select the option «10 days demo». In order to get demo-version for 3 days fill in the form using trading account number which will be used for the indicator’s testing. After that we’ll send you compiled demo of the indicator.